Where will you go, and why did you choose those countries? We will spend two weeks seeing Sydney and Melbourne. Our first international flight of the trip is 15th February to Singapore. From Singapore we move overland through Malaysia, Thailand, Laos, Cambodia, Vietnam and up through China. From there we will make our way to Europe, on to South America, USA and Canada. We chose to visit South East Asia as it is so different to our culture in Australia and New Zealand and we feel it will be a real eye opener for us. Also the history and food of the Asian countries was a big draw-card. Europe is somewhere that we have always wanted to visit. In particular we can’t wait to attend Oktoberfest in Germany and discover Ireland and Scotland. How will you usually get around? We plan to use the local public transport as much as possible. Transport costs can really add up on a big trips so keeping them to a minimum will be key for us. We will use local buses and trains as much as possible. What do you think it will be like traveling for a long period of time? We are both excited and anxious about our impending departure for long term travel. Traveling for a long period of time will be an eye opening experience and have us adjusting to different environments constantly. It will be relaxing some days and stressful others but we are going to make a conscious effort to cherish every moment and remember to laugh, even when the going gets tough. What motivated you to go on your trip? 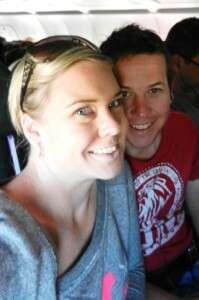 When we got engaged in 2007 we dreamed of heading off traveling for 12 months for our honeymoon. In the end we decided that visiting a different country every year was a much better plan. We purchased our first home and got married. 2 years passed and we realized that our plan of visiting a different country each year was perfect in theory but not realistic as although many people say this is what they are going to do general everyday life takes over and many never actually end up doing it. So we decided that we would put the house on the market and if it sold we would travel. Within 48 hours we had a contract on our house – the sale went so smoothly we knew we were on the right path for us. We sold our house and 4 months on we are departing fur our around the world adventure. We visited USA in June 2011 as our first real international experience. We suffered from severe culture shock. We were amazed at how uncomfortable and lost we felt. We realized that we were becoming too comfortable in our daily life to the point of not being able to see past our own front door. We decided that it was important for us to learn about, experience and understand different cultures – so we decided world travel was the way to break down these barriers and have us living our life to the fullest. What do you expect to learn about yourself? Kim: I am not good in crowds and during this trip this is something I am going to have to overcome. Also I think I will learn that I am capable of doing things that in my normal every-day life I would never even attempt – putting myself out of my comfort zone, although daunting is something that I am looking forward to as it will allow me to expand my horizons and gain new hobbies and friends in the process. Duane: I expect to learn how to face my fears of being lost. I always need to know where I am going and how to get there – on this trip this will not always be possible and this is something that I am going to have to learn to accept and be comfortable with. What’s the best place you’ve ever been to so far (and why)? We both agree on this one – San Francisco, California. We loved everything about San Francisco from its old homes, Chinatown, Marina and Awesome biking/walking paths. There are so many options for things to do with the Yarra Valley so close, Alcatraz, Golden Gate Bridge and many pubs to check out, it is a city that has an awesome vibe where we felt comfortable and safe. How did you determine (or manage) your budget for your trip? The main source of information for our budget came from budgetyourtrip.com as it gave us a starting point of a daily budget and allowed us to calculate how much we can afford to spend daily on accommodation, food, transport etc. We have a detailed spreadsheet that we will use to keep track of our expenses on the road to ensure we are staying within our daily budget. Finances had been something that we were extremely worried about however using budgetyourtrip.com and having our spreadsheet up and running has taken the stress out of it and allowed us to have confidence in managing our finances whilst on the road. Any advice for other travelers? Cherish every moment on the road, you are living the life so many can only dream of. Thanks guys, have a great trip!